(originally posted November, 2007)…are one in the same person! Had a great lesson 4th block today. 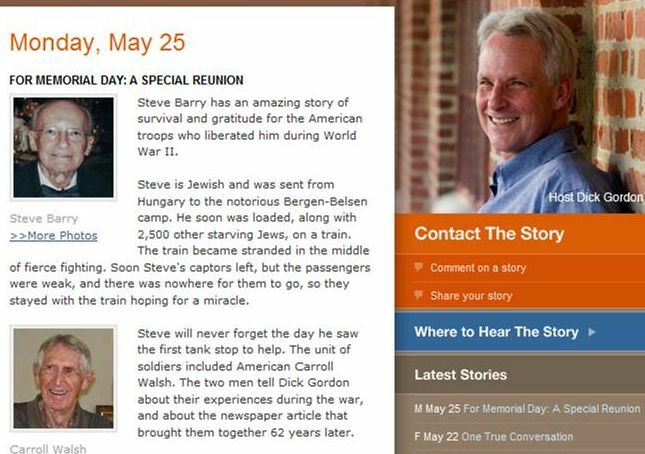 My high school seniors and I were treated to a wonderful interview with Mr. Steve Barry, 83, of Florida, who graphically described his liberation from that train nearly 63 years ago. He said “The South Florida Sun-Sentinel published an article titled “Vet unites with 3 death train survivors” Needless to say I was in a state of shock, and to some degree I still am, to find out after all the years, that the event burned in to my soul for all eternity, is shared with a lot of other people.” He went on to relate to my students and I the account of his ordeal and liberation, his emigration to the United States and his experience in becoming the “happiest Korean War draftee”, who ironically served his adopted country as a US Army Ranger in Germany. SOMETIMES THE FACTS OF REALITY DWARF THE WILDEST FICTION. 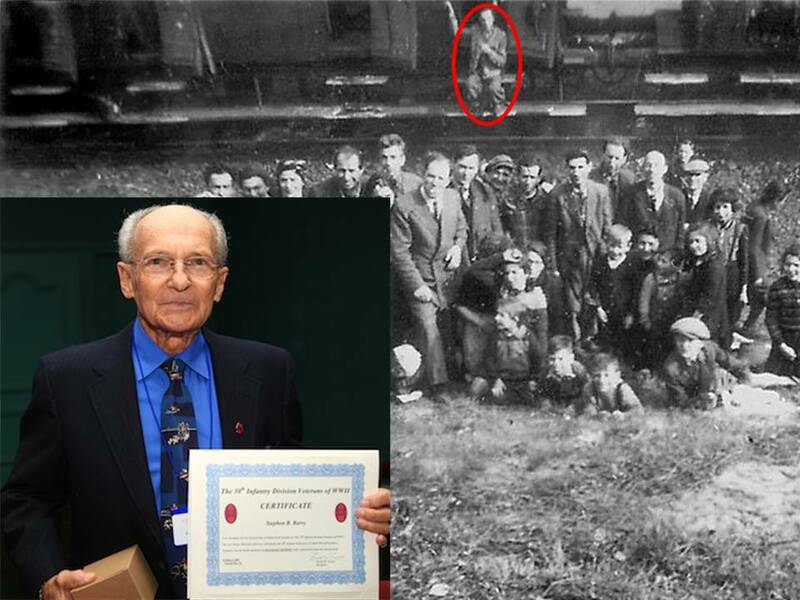 My odds to meet, after 62 years, one of the brave soldiers who came across “ That Train Near Magdeburg” on April 13, 1945 was less then nil. I beat those odds and managed to survive and preserve my body and sanity. Carrol Walsh fought his way from Normandy to the Battle of the Bulge and to the Elbe River earning five well-deserved battle stars. For him, coming upon that train and a mass of emaciated, skeletal men, women and children was only one of many sad episodes of the war. Little did he realize it then that to me and countless other survivors he became an ICON rekindling our faith in human kindness. He became our LIBERATOR and will always remain that. As it was prearranged on November 3, 2007, after picking up my daughter Barbara at the Tampa airport, (she flew in from Baltimore just for the occasion, traveling with my daughter Jamie and son-in-law Jerry, drove to the home of the Walsh’s in New Port Richey, FL. Carrol and his wife Dorothy stood at the driveway waiting for us. I walked over to Carrol, shook his hand and we embraced, then I proceeded to kiss Dorothy. My entire family followed my example. Later after our meeting came to a conclusion, Carrol and I both felt like two old friends meeting after many years. Inside, the table was set for coffee and tea and assorted snacks. We decided that it was more important first to engage in conversation, reminiscing about the discovery of the train and the aftermath. It was sort of a Q & E. Then we talked about our lives after the war. We learned that Carrol became a State Supreme Court Justice. We exchange some pictures and observed a wonderful photo of the Walsh’s large, attractive family. During conversation it was discovered that Carrol’s grandson, Sean, attends G. W. University just as my granddaughter Amanda does. Meeting Carrol and Dorothy Walsh is one of my most treasured experiences. They are, without a doubt, the sweetest, warmest and kindest people I have met. Meeting Carrol was dream come through and I especially enjoyed his boundless sense of humor. Dear friends, Carrol and Dorothy, you restored some of my faith in humanity and I never, ever will forget the privilege to know you and call you my friends. P. S. Yes, there are Angels but they have no wings; we call them FRIENDS. “Red” Walsh to Steve: “You don’t owe us – we owe you! We can never repay you and the Jewish people of Europe what was stolen from you – your homes, your possessions, your businesses, your money, your art, your family life, your families, your childhood, your dreams and all your lives.